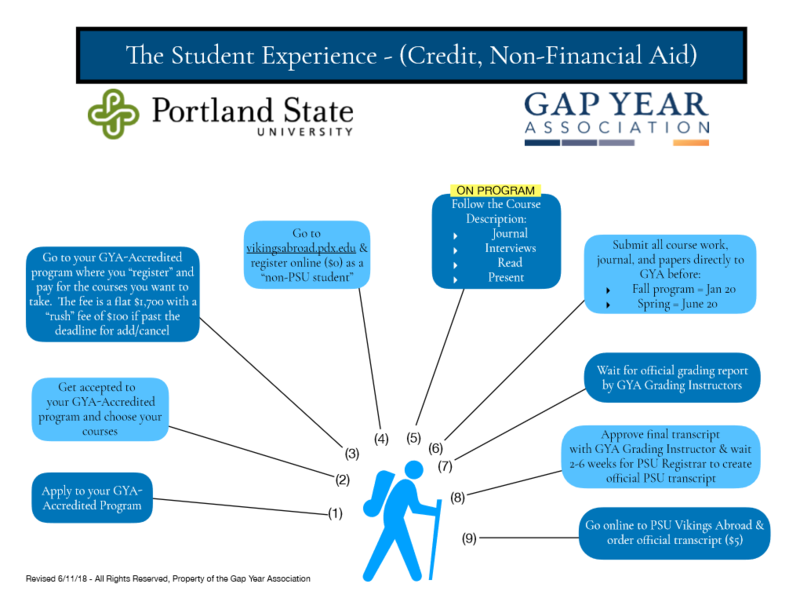 During the Gap Semester, students have the option to earn up to 18-quarter hours (12-semester credits) of college credit through Portland State University (PSU) and their partnership with the Gap Year Association (GYA). PSU is accredited through the Northwest Commission on Colleges and Universities which is widely accepted throughout the country at both public universities and private institutions. PSU has been named one of the nation’s “most innovative” colleges for the last four years by U.S News & World Report in recognition of their leadership in finding new ways for students to succeed. Portland State University offers a number of courses designed to allow students to earn academic credit for international study or volunteer experience. The courses do not require you to go to Seattle, and there is no physical classroom. The course meets electronically by email, mail, phone or fax. Reading, journaling and paper-writing are an integral part of the curriculum. There is a high degree of latitude for you in determining what you would like to study within each course – you can focus on the aspects of the region or culture that are of most interest to you, and most of the 13 offered courses fit into the structure of the ARCC Gap Curriculum on any ARCC Gap Semester. In this 200-division course, students will better understand the ways local populations are impacted by their location – environmentally, historically, culturally, and/or economically. Students will explore how social divisions occur as well as how divisions can be positively addressed. Students will learn about how the local culture has evolved to its present state, and strive to understand what influences environmentally, historically, culturally, and/or economically have influenced it. This course introduces global perspectives, basic concepts and fundamental questions of geography. It focuses on how all locations on Earth are interconnected and explores how humanity uses the planet as varies from place-to-place, comparing and contrasting to the students’ home. Students will work to understand the growth and distribution of human populations; the complexities and varying systems of land use; geopolitics and colonialism; the geographic impact of selected issues such as gender issues, poverty, racism, religion, etc. Students will be exposed to alternative healthcare systems and alternative healthcare practices. They will learn about the pros and cons of the host-country’s health and healthcare, and chart progressive ways to improve. Possible areas of focus might include, obesity, infant-mortality, domestic-violence, addiction issues, HIV/AIDS transmission and prevention, nutrition, water sanitation, etc. Students will explore the psychological differences and similarities across cultural boundaries, and explore issues like “what is success across cultural lines” and “how does language determine worldview?” Students will challenge their own cultural norms and identify cultural biases in undertaking this course. It offers the student an opportunity to reflect on the complex relationships within the host culture surrounding a particular event, the cohort of peer-students in which students form a relevant identity, and their own history. Students will have an option to write an ethnology based on living within a foreign culture for two months and use their cohort experience for a detailed study of social systems and self-growth. Students will enhance their understanding of global economics and gain a first-hand experience of the ways that international policy impacts local populations and seek an understanding for how the global supply chain works. Students will be asked to trace a particular commodity from production to purchase, with each step along the way understanding where the dollars have passed and what are the results from each step. In this study of colonialism and the history of Western influences, students will strive to understand the influences that colonialism has had on the host country. Students will explore the ways local cultures have been impacted by the influences of “westernized countries” that might include infrastructure (roads, trains, and transportation), language, gender roles, world-view, social justice issues, sanitation, food, politics, political influences, natural resource management, etc. This course provides students with an opportunity to learn through work experience and volunteer service concurrent with assignments while on their academic study abroad program. It engages students in meaningful work/volunteer experiences while helping them gain an understanding of a particular issue of their choosing relevant to globalization and its impacts on local populations including international development initiatives. This course creates an opportunity for students to assess and understand differing models of leadership in modern societies. Students will explore varying models of leadership from a host culture perspective, compare them to the student’s home culture, and assess personal leadership strengths. Students will be expected to integrate information from participant observation, research, readings, and interviews to inform conclusions. It offers the student an opportunity to learn outside of the classroom and affords an opportunity to take advantage of appropriate technology, sustainability issues in the developing world, and to learn first hand about local issues of environmental sustainability observed through travel and service learning. It offers the student an opportunity to learn outside of the classroom and to learn first-hand about local issues of global citizenship observed through travel. It will provide an introduction to the richness of cultures in the world, drawing on perspectives from the locals themselves, and rooted in the humanities and social sciences. Students will explore the balance between political, economic, environmental, and cultural systems, to cultivate skills and attitudes in support of global citizenship. It offers the student an opportunity to learn outside of the classroom and affords an opportunity to learn first-hand about how climate change affects local ecosystems and the people that depend on them. Through travel and service-learning, the course will equip students with an awareness about global impacts of climate change; students will be able to identify specific impacts local to their travels that result from rising CO2 emissions; and students will research how multiple issues of climate change can compound for great effect. The PSU tuition cost is a flat fee of $1,700 which must be paid to ARCC prior to registering for courses with PSU as a “non-PSU student.” The tuition will be collected by ARCC who will then submit this payment to the Gap Year Association for processing. ARCC and GYA must submit a complete list of students to be enrolled four weeks prior to the start of the Portland State University term. Enrolling after that four-week window incurs a late fee of $100. Students will submit their journals and coursework to the course Instructor of Record by June 20th (for Spring semester students) or January 20th (for Fall semester students). Grades are then submitted to PSU and the student receives an official PSU transcript. Instructors of Record are vetted by Portland State University for academic integrity and quality. Each grading instructor holds an advanced degree in relevant subject matter to grade for lower-level courses. To ensure that PSU travel/study abroad credit will successfully transfer and not interfere with a deferral plan, we encourage students to contact their college or university’s admissions office directly. For additional resources and suggestions, visit https://gapyearassociation.org/fav-colleges.php. For more information, including detailed course descriptions and the step-by-step instructions for how to register, please go to https://gapyearassociation.org/credit-faq.php. For specific questions contact a Gap Year Association representative at 503-206-7336 or your Gap Director at 415-332-5075.